On Thursday, April 30, Rebekah and I are presenting at the Central Virginia Writing Project’s Spring Writing Mini-Conference at the University of Virginia. We will be talking about using mentor texts (surprise!) and also about our experience of turning our teaching ideas into a blog and eventually a book. If you attend one of our sessions, you will be entered into a raffle to win a free copy of our book due out in September! Win a free copy of our book! 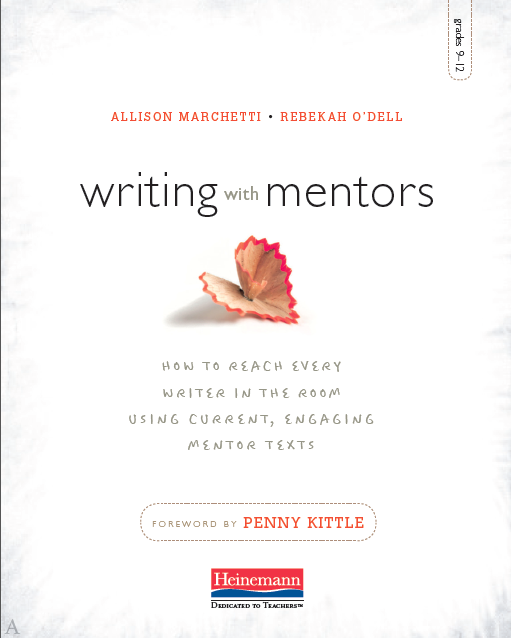 Classroom teachers and new Heinemann authors, Allison Marchetti and Rebekah O’Dell will share how to use multiple, current, engaging mentor texts to reach every writer in the room. They will show how mentor texts inspire and instruct students through every stage of the writing process, from planning to publication. Authors Allison Marchetti and Rebekah O’Dell, will share their experiences turning their teaching practices into a blog and then a published book with ideas about how teachers can do the same. They will give suggestions for ways to take a seat at the English Ed table and join a bigger professional conversation through writing and speaking. Click here for more information about the mini-conference and registration materials.